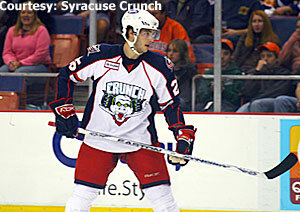 Derick Brassard, 20, is more than a player who is tied for the AHL lead in points (12). He is one of the best newcomers in the league and a welcome challenge to a proclaimed shift in Columbus’ philosophy toward its prospects. With almost every game he plays, Syracuse rookie center Derick Brassard tests the patience of the Columbus Blue Jackets more and more. The organization loves that he’s creating that problem. Brassard, 20, is more than a player who is tied for the AHL lead in points (12), and who is one of the best newcomers in the league. He’s also a welcome challenge to a proclaimed shift in Columbus’ philosophy toward its prospects. In the past -- in part out of necessity and in part to sell its anxious fans reason for hope -- Columbus had a habit of forcing major minutes on young players who weren’t ready for that responsibility. When Scott Howson took over as general manager last summer, he vowed that NHL shifts would be doled out based on production, not premature potential. In his cheery, passive-aggressive manner, Brassard, the No. 6 overall pick in the 2006 NHL Entry Draft, is doing his best to tempt the Blue Jackets into an early unwrapping of his offensive gifts. Howson was in Syracuse a couple weeks ago to see how quickly his prized fruit was ripening. Brassard told him it was tough, at first, for him to come to Syracuse, but now he’s having a ball. Howson said he would keep Brassard with the Crunch at least through a recently concluded eight-games-in-11-days stretch, and then re-evaluate from there. That tipping point could be bearing down on Columbus like Brassard on a breakaway. Brassard's brilliance in his first few weeks in the AHL earned him league rookie of the month honors for October. In a sense, Brassard is a victim of his own considerable talents. Two rookies did make the Blue Jackets to start the season, Jared Boll and Kris Russell. But Boll is a third-liner who can be used in a limited role and Russell addressed the team’s need for a playmaking defenseman. Brassard is wasted in the NHL unless he’s eating up one key shift after another as a first- or second-line center. Columbus wants to make sure his game is mature and well-rounded enough to carry that burden. So satisfaction has to come in other forms for Brassard right now. Reward No. 1 is just playing. One reason why the Blue Jackets want to ease Brassard into the pro game is that his farewell in juniors was just a blink. He took a cross-check in an exhibition game while playing for Drummondville of the QMJHL that caused a badly separated shoulder. It eventually needed surgery that cost him more than half the season. Brassard returned to total six goals and 19 points in 14 regular-season games for Drummondville, and that was just a warm-up. He went 9-15 in 12 playoff games, tagging himself as a big-moment player. That’s the kind of effort the Crunch are now seeing. Brassard is the team’s top center, and he looks right at home jumping into such an important role. His speed is NHL-caliber right now, no doubt, and is creating all kinds of opportunities for his linemates. His shot is hard and true. And the real shine on his game is his playmaking sense, which is good enough for him to play the point on the power play. His speed is NHL-caliber right now, no doubt, and is creating all kinds of opportunities for his linemates. And the real shine on his game is his playmaking sense, which is good enough for him to play the point on the power play. 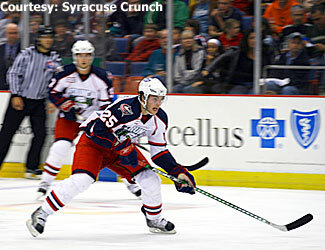 Columbus saw proof of that off the ice before it even snatched up Brassard, who hails from the Ottawa area. He speaks excellent English, but he just picked up the language a couple years ago. One of his tutors was ESPN’s SportsCenter, as he watched how players getting interviewed handled themselves. Going into the team interview process at the 2006 Draft, Brassard could have asked for a translator to help his words come across exactly as he intended. But that would have been the easy way out. Instead, he went through 27 interviews – basically job applications – in English. Sure, the 116 points he scored in 58 games for Drummondville in 2005-06 said all the Blue Jackets needed to hear heading into the draft. But the small gesture of pushing himself verbally was tucked away in the Blue Jackets’ file. Sometimes the best messages come across with no words at all. Maybe it’s just an old habit, or perhaps the way he inhales through his mouth, but in the heat of practice and game action it actually looks like Brassard is smiling. It’s almost as if pressure, expectations and finances aside, he’s just a guy out there on the cusp of figuring out what he can do. After a recent Crunch practice, for instance, he was toying around with some not-yet-ready-for-a-game moves. He picks them up all the time, mostly from YouTube clips. First, he back-kicked a puck from the heel of his skate to his stick, and then bounced the puck on his stick. Later, he skated behind the net, flipped the puck off the netting, caught the rebound with his stick, batted it in the air while he skated around to the crease and popped it in. From someone else, it might have come off as showy. Watching Brassard, it simply had the feel of wonderment from a player who can find reason for a grin wherever he is.